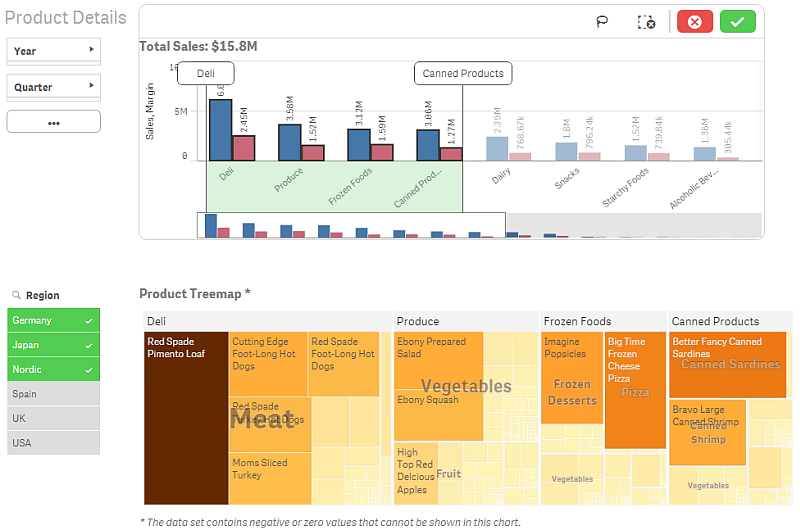 You make selections by clicking and drawing in the different visualizations. 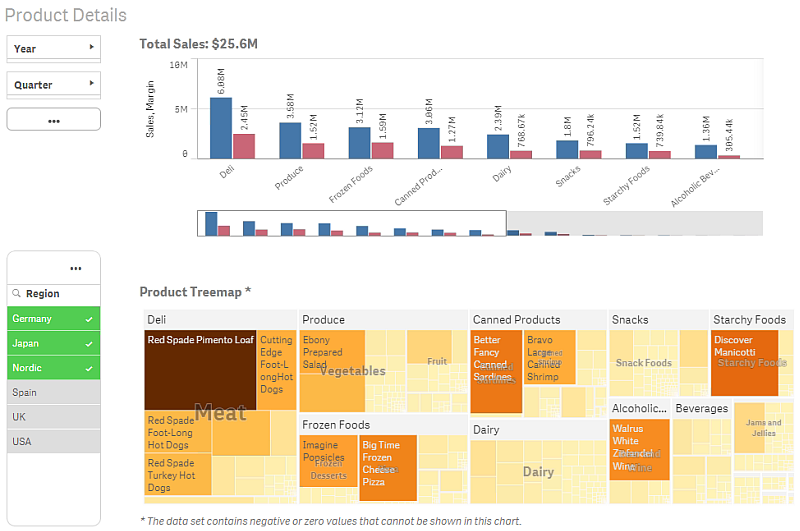 When you make a selection, all associated visualizations are updated immediately to reflect the selection. 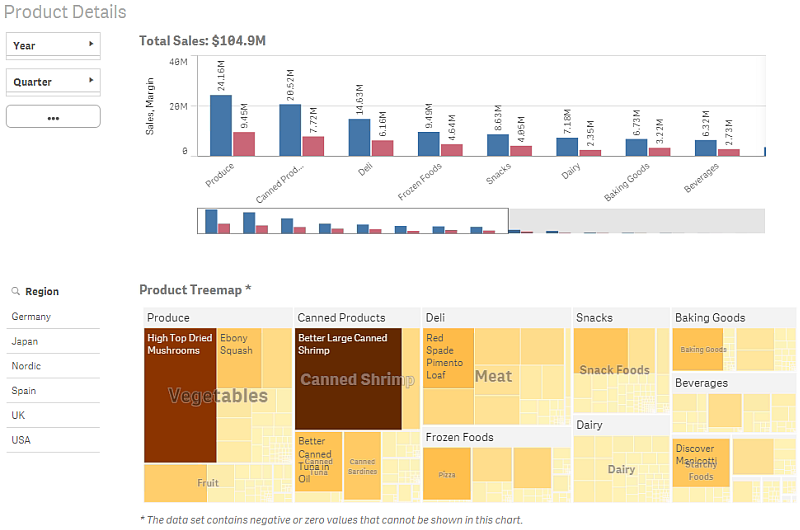 You confirm the selection by clicking m, or by clicking anywhere on the sheet outside the visualization, including in another visualization, (in which case you generate a new selection). You can also press Enter to confirm. You cancel a selection by clicking E. You can also press Esc to undo. By default, new selections in a visualization are added to the previous ones. You deselect an item by clicking it. On a computer, you can hold down Ctrl while you make a selection, to automatically clear previous selections in a visualization, and only keep the new selection. The following images show how the visualizations are updated immediately when a selection is made. Sheet view with no selections made. In this image, a selection is made (in the filter pane Region) and is reflected in all associated visualizations. A selection made in the Region filter pane. In this image, a second selection is made (in the bar chart Total Sales). It automatically confirms the first selection and presents a preview of the new selection. A second selection has been made in the bar chart Total Sales. Note: When making selections in filter panes there is a difference between Cancel selection (E) and Clear selection (:). With Eyou only clear the latest selection, but : clears all selections.